Pine Hill Park has a unique rocky landscape. You might not notice because our volunteers have done a good job at smoothing out the trails. And maybe the leaf litter obscures what is underneath. Or maybe you are one of our long-time users that have noticed some of your favorite trails becoming rockier with time. Also, as you travel on to the adjacent Redfield Trails and Carriage Trails, you may have noticed that rocky character of Pine Hill Park quickly disappears. All of this is largely because of the underlying bedrock. Cliffside on Ledges Lane of the Redfield Trails. Pine Hill Park rests upon bedrock that is called the Cheshire Quartzite, which is named for Cheshire, Massachusetts where it was originally discovered and mapped by geologists. It extends north and south near the boundary between the Green Mountains/Berkshires and Taconics. The Cheshire also has laterally equivalent layers of quartzite that extend into Canada and southern Appalachia, however these layers can have slightly different characteristics due to their history. The Cheshire Formation got its start in life as a near-pure quartz sand that has since been buried, heated, and then squeezed by three subsequent collisions with other continents. All that heating and squeezing helped to make the beautifully smooth texture that compels you to lower your center of gravity (or land on your backside) on a wet day. It also causes the natural partings and breaks (faults and fractures) that can be seen in the quarry at the end of Crusher Road. This bedrock formation is an approximately 1,200 foot thick layer of quartzite, which is entirely composed of smooth-grained quartz. The sand was deposited just off the coast of an ancient ocean. We know this because marine animal fossils have been found in other Vermont locations where the Cheshire is exposed at the surface. These fossils suggest an age of around 530,000,000 years or what is known as the early (lower) Cambrian Period. The fossils of this age are notable because they mark the beginning of life as we know it. Quartzite is one of the most resilient rocks at Earth’s surface. It is relatively immune to things like the acidity of groundwater and freeze-thaw cycles that obliterate other rocks. This is because of the very strong bond between the silicate molecules (SiO2) that make up its basic structure. Most rocks will break apart relatively easily (over long periods of time) along the bonds between their basic building block molecules. However, quartzite molecular bonds are so strong that breaks in the rock only occur through the basic quartz molecule, not along the edges where it bonds to others. This is still a difficult thing to do and is why quartzite breaks in glass-like shards (conchoidal fracturing) and sparks fly when struck with a hammer or another piece of quartzite. The resiliency of quartzite means that it is not particularly good at producing soil. In fact, the very thin soil that you encounter on the Pine Park Park trail tread is glacial till material left over from when the last glaciation behaved like a gigantic bulldozer running across Vermont. The till varies from a sandy to silty texture with an orange color that is due to oxidation, much like rust. Inside this soil is jumbled (poorly sorted) Cheshire Quartzite boulders and pebbles with an assortment of rounded cobbles from other parts of Vermont. This helps explain why there seems to be no rhyme or reason to where and how soil deposits occur on Pine Hill. It is also interesting to note that virtually no additional soil accumulation took place on top of the Cheshire Quartzite in the past 10,000 years. The above photo is from near the main entrance and shows a cut into glacial moraine material, which is much thicker than the till that sporadically covers most of the park. The sediment pile creates a sort of bluff overlooking the park and contains a variety of unsorted rocks of various sizes. The way that quartzite breaks apart also means that it is not very good at providing the friction that keeps you upright. For comparison’s sake, the nearest trail system (and perhaps only) that is built upon similar quartzite is found on South Mountain in Michaux State Forest, Pennsylvania and extending into the South and Catoctin Mountains of Maryland. Similar poorly developed soil profiles are present, but the quartzite has course crystals that provide a little more friction and no glacial sediments are present. Although it is coarse to the touch, the wet quartzite of South Mountain makes many of their trails impassable for bikes when the rocks are wet. This is because those trails are not built like ours in Pine Hill where mineral soil is brought onto the trail tread and large rocks are moved aside. It also means that the trails of South Mountain are expert-only because the trail tread is almost entirely rocks and boulders. In Pine Hill the smooth crystal structure of the Cheshire Quartzite places even more limitations on friction between mountain bike tires and hiking boots. Every local mountain biker I know has taken a tumble on Lonely Rock. And I have seen several volunteers unsuccessfully test my warning about walking across wet rocks. Many times it only needs to be a humid day for you to break your arm. The trails of Pine Hill Park have been built for the entire community with the goal of increasing access. This means that many rocks and boulders have been moved, trails are routed to avoid locations with no till, and that rigorous and unique trail building practices had to be adopted. In many places of the world more rocks on the trail is a good thing. In Pine Hill Park more rocks means building the world’s largest Slip and Slide or Wet Banana. Without realizing it, the trail builders of Pine Hill were receiving a lesson in geology. With a little observing it is possible to see how this learning progressed from older rock-bordered trails that channelize water into ever-deepening ditches to newer out-sloped trails with rolling dips that disperse the water from large rain events. You can also take note that many of the trails are routed in such a way that seems to avoid rocks, which is the opposite of what builders in other trails systems tend to do. The above photo is between intersections 30 and 30A. It shows an older style of trail building where rock walls were constructed (right side of trail) to hold in the trail tread against the slope (left side). This had the opposite of the intended effect where storm water would follow the same path and create even greater erosion. There are several trails in the park that have this old feature. Please consider volunteering if you would like to learn about modern trail building practices while mending these relics. The Cheshire Quartzite trail tread profile disappears as it passes from Muddy and Rocky Ponds toward Proctor on the Carriage Trail. It also shows a drastic change moving toward the Redfield Trails. 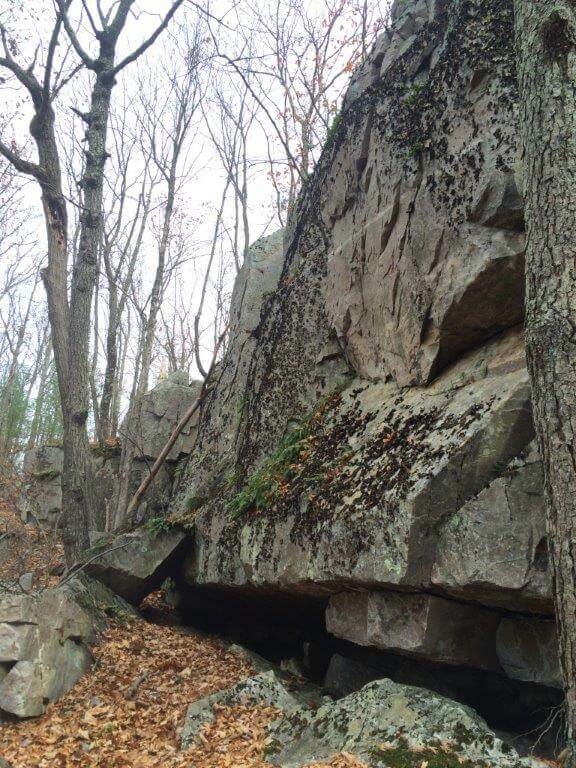 In fact, it is a striking coincidence that the boundary between the city-owned land of Pine Hill Park almost aligns perfectly with the bedrock boundary between the Cheshire Quartzite and the Dalton Formation. Perhaps it is not a coincidence. Maybe our ancestors noticed the difference in soil quality and divided the land as such? Moving toward Proctor on the Redfield Trails and for a short distance past Muddy and Rocky Ponds you will find yourself on top of the Dalton Formation. The double- and single-track trail portions are relatively smooth while outcrops of rock similar to Cheshire Quartzite are visible. The Dalton Formation is a quartzite and parts of it look a lot like the Cheshire Quartzite closer to Rutland, but the rock is much older and it contains an important mineral called feldspar. This is the primary source for clay in soils around the world. Where the Redfield Trails dip away to lower elevations of the Otter Creek Valley can also be explained by the the Ira Formation. This formation is composed of limestone and is much less resistant to weathering. For the full length of the Appalachian Mountains, limestone rocks underlie the valleys and quartz-rich rocks form the ridges and peaks. This is a persistent geologic pattern that largely controls the location of everything in our immediate surroundings. Looking directly out from the overlook above Rocky Pond at the intersections of Shimmer, Overlook, and Stegosaurus Trails is Blueberry Hill, which is also capped by outcrops of Cheshire quartzite. In fact, several hills within the Valley of Vermont, such as nearby Cox Mountain and Bald Peak in Pittsford and Green Hill in Wallingford are also “held up” by the Cheshire Formation. Moving toward Proctor as the Carriage Trail makes its descent off of the Dalton quartzite of Library Pass and across a short bit of the Ira limestone, is the Winooski Formation, which is a dolostone. This rock is a magnesium enriched limestone, which is easily weathered and provides a developed soil profile. In fact this can be seen in the very smooth final switchbacks of the singletrack that bring you down into town. These lower elevations on the flanks of Pine Hill are also covered by a thicker layer of sediments from a river (aluvial), old lakes (lacustrine), and glacial moraines. The exception is where Cheshire outcrops occur along Grove Street. Some geologists hypothesize that there was an ice dam near the location of Evergreen Cemetery during the last glaciation, which is invoked to explain the extensive lake-derived clays found in the valleys. The general point of this story is that geology explains much of what you see in terms of where trails have been located or sited, what maintenance practices are employed, and generally why we are such sticklers for details. Please consider donating if you enjoyed this story and would like for us to continue stewarding this unique recreation resource. Brace, W. F. (1953). The geology of the Rutland area, Vermont. Vermont Development Commission. Ratcliffe, N. M., Stanley, R. S., Gale, M. H., Thompson, P. J., Walsh, G. J., Rankin, D. W., … & McHone, J. G. (2011). Bedrock geologic map of Vermont (No. 3184). US Geological Survey. 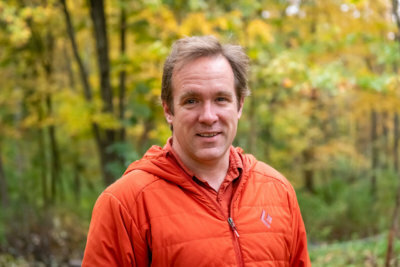 Van Hoesen, J.G., (2009). Final Report Summarizing the Surficial Geology and Hydrogeology of Rutland, Vermont, Green Mountain College.